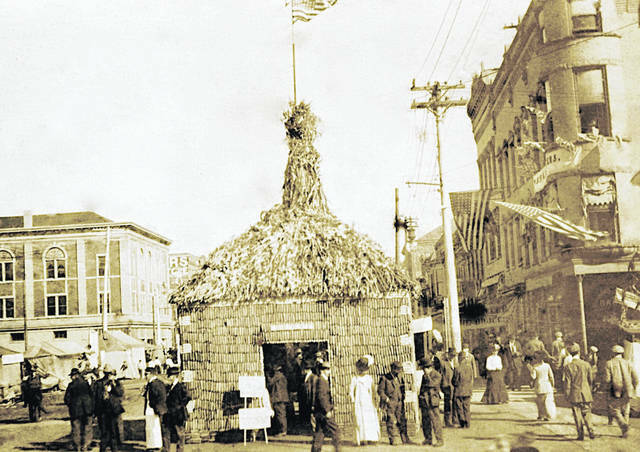 This photo shows a street fair and the “Punkin Palace” in downtown Hillsboro on Oct. 6, 1909. 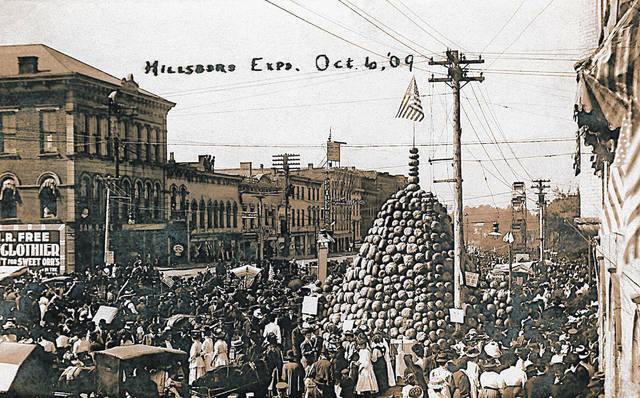 This photo shows a street fair and “Corn Palace” during an exposition in Hillsboro in 1913. Editor’s Note — On March 15 this year The Times-Gazette published a postcard photo of the “Punkin Palace” from what was called the Hillsboro Expo in October of 1909. There was little information about the photo at the time, but Christopher S. Duckworth, who has family ties to Hillsboro and Greenfield, was able to provide more detailed information. Duckworth spent three decades at the Ohio Historical Society, where he was founding editor of Timeline magazine, followed by another 10 years at the Columbus Museum of Art. Today, he owns his own publishing company, Brevoort Press LLC. In an email to The Times-Gazette, Duckworth wrote: “I was rather surprised to read the piece about the Punkin Palace in The Times-Gazette. You see, I have had an interest in the subject for years, and I have collected the photo postcards and news clippings of it. I have been intending to write an article about it, but alas other projects have precluded my best intentions. However, when John Glaze and I revised ‘The Hillsboro Story,’ we included a photograph and news clipping. “… I think that the palace first made its appearance in 1907, and I am not certain whether this took place every year or for how long. Note that a corn palace also was featured at least once. “My interest was piqued several years ago by a postcard that I have labeled Pumpkin Card Front and Pumpkin Card Back. You see the emboss of ‘AYRES’ STUDIO, HILLSBORO, OHIO’ on the card. This was my great-aunt, Sarah Ella “Byrde” Ayres’, studio located on North High Street… I purchased this postcard on eBay. When it arrived, I was stunned to discover that it was addressed to Escoe Ervin at 101 Brevoort Road, Columbus, Ohio. “In 1951, my family (I was two years old) moved into 63 Brevoort Road. Growing up I came to know Escoe Ervin and his wife, Maude, quite well. In fact, I store my car in their garage. Today, my wife and I live in the house at 63…small world. “Editor’s Note: The following account of once-popular ‘street fairs’ at Hillsboro was found in the November 18, 1909 issue of the National Stockman and Farmer publication. It was submitted by Mrs. Harry Stoltz, Hillsboro Rt. 4. “We have had two very successful street expositions in our town (Hillsboro) and these expositions and their success were due to the efforts of the Hillsboro Business Men’s Association and to the many others who co-operated to make these affairs a success. Premiums were offered for fine livestock, poultry, grains, fruits, vegetables, fancy work, etc. Bands, fireworks, parades, and other features and attractions were provided and as no admission was charged large crowds were in attendance. Just imagine the horse races taken out of the usual county fair and the remainder set down on the streets of a commodious little town of 6,000 people and you have a good idea of what these expositions are. “The entire cost ($1,700) of the exposition, with the exception of $500 realized from the sale of privileges, is borne by the business people and public-minded citizens. These expositions encourage more cordial relations between the town and country people, and the merchants who contributed consider the money paid as an investment in an excellent kind of advertising and that the good results will come in during the entire year rather than during the time of the exposition, though at such times trading was exceptionally heavy in all lines.